The Santa Maria held great hope for many people. 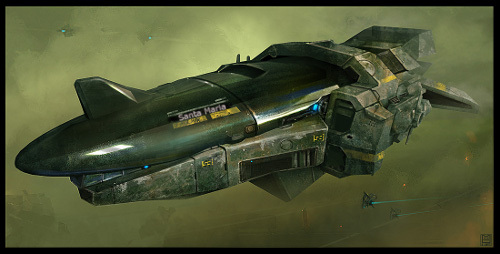 The colonizer class ship was launched from a space station orbiting Titan, one of Saturn's moons. On the 2nd of January 2213 four thousand people where launched towards Abyss' sun Luyten 726-8 AB. A small solar system approximately 8.7 light years away from Sol. With the recent advancements in propulsion and gravitational dampening man was now able to expand further into the stars. It would take the Santa Maria approximately 10 years to reach Luyten. The crew of the ship was two shifts, one for the first five years of the trip and the second for the last five years of the trip the ship didn't really need a whole lot of maintenance so each shift was a crew of 5 people. The other 3995 people on the ship where kept in a deep cry o for the entirety of the trip.